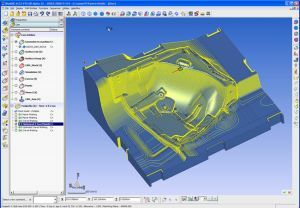 WorkNC, automated CAD/CAM software for 2 to 5 axis machining, has been specifically developed to solve the problems traditionally associated with machining complex surface-modeled parts. It features an automatic NC tool path generation based on surface geometry with Z-level roughing, Z level finishing, optimized finishing, powerful rest-material milling, pencil tracing, integrated post processing. WorkNC is capable to mill even the most-complex 3D models by implementing special machining strategies. Several different WorkNC modules are available like WorkNC-3X, WorkNC 5 Axis, WorkNC EDM, WorkNC Dental, PartXplore and WorkPlan. WorkNC is successfully applied in automotive, aerospace, defense, consumer electronics, engineering, general mechanical, medical & dental, tooling, mold and die, motor sport and other major industries. Here is more information, in which industries WorkNC can be applied. WorkNC has been continuously developed since 1988 and is currently used by thousands of companies around the globe from a range of industries. Customers include virtually all of the world™s automobile companies : Peugeot ®, Citroen ®, Renault ®, Volkswagen ®, Audi ®, Mercedes Benz ®, BMW ®, Jaguar ®, Rolls Royce®, Ford ®, General Motors ®, Nissan ® and Honda ®; aerospace companies including Snecma ® and Eurocopter ®; household appliances manufacturers including Calor ®, Miele ®, and Whirlpool ®; consumer electronic companies including Samsung ® and Motorola ® and a vast number of mold, die and press tool companies including the multinational Arrk ® Group.